A difficult read, and yet more grad school update. This is book number two I'm reading for this week, and it tears my heart out. 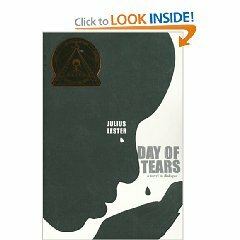 Day of Tears is a play set at a pre- Civil War slave auction. A plantation owner, addicted to card playing, has blown the family fortune, so must auction off most of his slaves. Some families are sold as a lot. Some are separated. An engaged couple is split apart, sold to owners in different states. The description of their raw grief is heartbreaking. Meanwhile, the two daughters of the planter watch. One thinks it's thrilling. The other feels absolutely sick. Though the style is minimalistic, it manages to evoke horror. Telling the story in a deadpan voice works well. It shows the hopelessness of the situation, the sense of having cried so much you don't have the strength to feel emotion any more. It's tough putting this one down, but such intensity is best taken in smaller doses. In other news - as I try to put this one on the back burner for a while – is I've picked the topic for my long paper assigned for Multi-Cultural Literature. I chose books depicting gay/lesbian/sexually conflicted teenagers. Strange that's considered another culture, but the point was to choose a group that's been marginalized in our society. My professor stated there's no one standard definition for multi-cultural, so basically what we see as appropriate is probably fine with her. She's approved my topic. Now I can start reading the 10 books (at least), working on the mini-reviews due for each. No more mini-disasters today, or crises, save the foreign object I found floating in my coffee cup this morning. Then again, it is early yet. There's a whole day ahead of me in which to display my absent-mindedness! The mind boggles. Previous Post Graduate school update, including another in the series of stupid acts. Next Post Will the holidays never end?